Space was tight and entertainment options sparse in the small one-bedroom California apartment that Nite Yun and her family shared after fleeing the Cambodian genocide. Her two brothers preferred to play amongst themselves, while her father was often away picking produce or clocking hours at a local Chinese restaurant. So Yun would usually join her mother in the kitchen, chopping lemongrass, gutting fish, sharpening knives—and learning all the while. Those skills and recipes now form the foundation of Yun’s smash hit Oakland restaurant, Nyum Bai, whose name means “Let’s eat!” in Cambodian. A testament to her heritage and her mother’s cooking, Yun opened Nyum Bai as a lifeline for a “nostalgic take on Cambodian food.” Bay Area patrons have responded with enthusiasm. The bright, airy dining room is now regularly crowded with a mix of expats, second-generation Cambodians, and non-Cambodians alike, all of whom come to feast on Yun’s made-from-scratch curries, noodles, soups, fried chicken, and more. Yun is part of that younger generation of Cambodian Americans, but for years, she never quite knew where she belonged. Her parents fled the murderous Khmer Rouge regime in 1976, traveling by foot until they reached the safety of Thailand. They settled in a ramshackle refugee camp where Yun was born several years later. When Yun was 2 years old, the family got lucky: A church group sponsored their immigration to the U.S. as refugees. The tiny Stockton, California apartment that the family settled in was often filled with the tunes of 1960s Cambodian rock and the intoxicating scents of Yun’s mother’s cooking. As Yun says, “No matter how poor we were, there was always a filling meal.” In the evenings, the space would fill up with Khmer neighbors drawn by the promise of dishes from back home and games of cards. At home, Yun fully identified as Cambodian. But when she started attending public school in the U.S., she realized just how different her family was from most of her new friends. She had to learn English, and she was introduced to new foods, such as McDonald’s and pizza. “I was confused about my identity for a long time, just trying to decide which side to take,” she says. In 2005, Yun traveled to Cambodia, excited to discover her roots. But she did not receive the homecoming welcome she expected. Many people she met pointed out that she spoke with an accent, had light skin, dressed like a Westerner, and behaved differently—in short, that she wasn’t a true Cambodian. “I was bummed out, because I had so much pride about being a Cambodian and identifying as Cambodian,” she says. After she returned to the U.S., though, an important realization finally dawned on her: She didn’t need to choose. She could be both Cambodian and American. By this point, Yun was living in San Francisco, where she delighted in the city’s diversity of foods, from overstuffed burritos to handmade pasta. But she struggled to find a Cambodian restaurant that captured the essence of the nation’s flavors, rather than one that just served watered-down Southeast Asian fusion. Yun decided she could be the one to change that. After long conversations with her mom and deep dives into her childhood memories in the kitchen, she began to recreate the dishes of her youth. She also went back to Cambodia to interview chefs and home cooks about their favorite foods and recipes. “The flavor of how things are supposed to taste guided me in learning to cook Cambodian food,” she says. Back home, she honed her skills and grew her network at La Cocina, an incubator program for food-related startups. She soon launched a Cambodian supper club, the success of which gave her the courage she needed to create Nyum Bai. 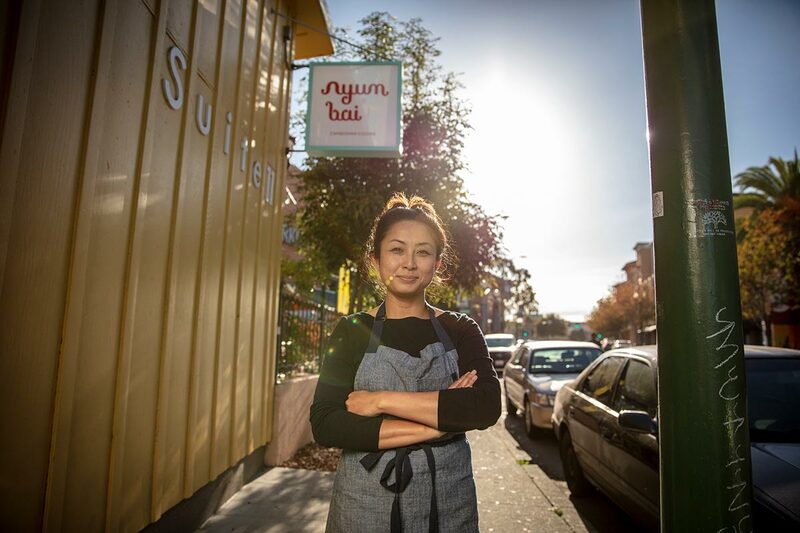 Since Nyum Bai opened early 2018, the restaurant and Yun have scooped up several awards, including a place on Zagat’s “10 Under the Radar Chefs to Know in SF” list, a three-star Eater review, and a spot in Bon Appétit’s top 10 restaurants in the U.S. roundup. All of the food is cooked in small batches to preserve flavor and freshness, and all is made from the freshest seasonal produce. In some ways, it’s already happening.